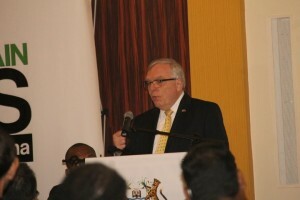 Canada’s High Commissioner to Guyana, Pierre Giroux speaking at Turkeyen-Tain Talks. Canada’s High Commissioner to Guyana, Pierre Giroux says Guyana needs to take several practical actions, including the arrest and conviction of drug lords, and vote with the United States (US) in international organisations to help build solidarity with the incoming Donald Trump administration. “The first thing- do arrest two or three drug lords and then you’ll see you’ll get the attention of the United States as being a friendly country. So look at the security aspect and try to catch a few of the drug lords and then once you catch them make certain you try them and condemn them in a very rapid way so they’ll see you are really serious about fighting drugs,” he told a University of Guyana (UG)-sponsored forum titled “After Obama, More History: Implications of the US election for Guyana and the rest of the Western Hemisphere. Giroux also suggested that practical diplomacy should entail adhering to rules laid down by the Financial Action Task Force to counter money laundering and ensure that dirty money is not filtered through the natural resources sector by joining the Extractive Industries Transparency Initiative (EITI). As a policy taker that has to adapt to decisions taken by policymaking countries, the Canadian envoy recommended that Guyana becomes a “friend of the policymaker” by holding free and fair elections. “Very important for members of parliament who are here, maybe, you have to really project yourself as a conciliatory, working democracy because this is something they (US) will observe,” he said. The Canadian High Commissioner further recommended that a “constructive engagement” tone especially in efforts to woo American business more so because President-elect Trump is a businessman. Already, he said Guyana is poised to become a great friend of the US because the American oil giant, ExxonMobil, has discovered oil. In the area of international diplomacy, Giroux said Guyana should cast its vote with the US as much as possible because American officials would be watching carefully to see who votes with Washington, against or abstains. The Turkeyen and Tain Talks is aimed at stimulating public discourse on topical issues of local, regional and international importance. Turkeyen and Talks 5 is scheduled to be held in January 2017 and will focus on public health in Guyana.